Are you fascinated by birds, their ability to escape the confines of earth with flight, their marvelous color patterns and not in the least, their song? Have you complied a life list over the years? What are your favorites among those birds you have seen and heard? Having watched and studied birds most of my life and compiled a substantial life list from various parts of the country and beyond, I have my favorites amongst the group and they are now prominently displayed on the wall in my great room as seen on the right. It might even be fun to include your state bird in the center of that group. I am in the process of including all the state birds in my collection. Enter the gallery by clicking on any of the images or on the gallery link above, and see what you like. It was quite a struggle, but spring is surely here to stay. The snow has melted back to just a few patches in the woods. There are faint areas of green erupting from the soil and the daffodils are showing more of their sunny heads. Four does appeared in the fields yesterday around dusk; three of them were roundly pregnant and the fourth doe was smaller and perhaps a late fawn from last year. They spent over an hour tasting the new grass shoots, obviously enjoying their dinner. Where have all the April showers gone? Once more, Saturday was beautiful. People were finally able to get outside and do a little bit of yard work, raking, cleaning the salt and gravel off their lawns left by the snow plows, thinking about spring planting time, and just enjoying the day. Then came Sunday, Monday and now Tuesday. The snow has returned covering us in a blanket of white once again. My red maple in the side yard has burst forth with tiny red flowers, the daffodils have poked their heads up and to their surprise, find it cold and wet once more. My money is on the daffodils winning out in the end. As I was sitting in the sunroom today under a cloudy sky enjoying a luncheon salad, a dark, brown shape obscured my view of the sky. As I stood up to see what it was, a large adult bald eagle flew overhead and as he crossed the pasture, he pirouetted and made a steep dive towards the ground. He landed with a bounce and walked over to a pile of wet loose grass. He picked through it, selecting the best parts in his beak and once satisfied, took off easily into the air and headed towards the pond. It is time to do some nest maintenance for the new arrivals. Today is bright and sunny, full of promise. The robins finally have spots of bare ground to search for morsels to eat. These newcomers are males, arriving earlier than the ladies, either to move further north or set up shop here on my farm. Welcome home! 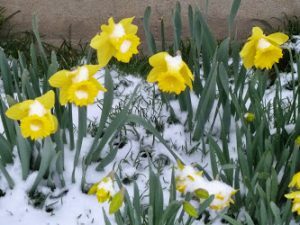 It seems as we slide into the month of April, we have a weather contest unfolding. On any particular day, we might have sunlight, snow flurries, a cloudy sky and then a full blown snow storm covering the ground again with a blanket of snow. The sun returns and spring seems to be gaining a hold. As the cold returns, the snow again blankets the fields until the sun wins the day again. Each day has been a cornucopia of weather systems, never to last for long. It is this border between two seasons, winter and spring, that holds the wonder of things to come. It is a challenge for the returning migrant bird population, but they seem to be up to the task. I just knew February was not going to be the last of winter, even if the ground was bare and the temperatures balmy. March is still roaring like a lion (thanks MGM!). I have little lanes carved out to reach the bird feeders which I have had to clear several times a day as it continually snows, even if just a little bit. We are still feeding the chickadees, juncos, blue jays, several house finches, purple finches, titmice, goldfinches and a family of crows. I have noticed that the goldfinches are scrappy and will chase off the juncos at every turn. At least it is daylight savings time and we are on the downhill run to spring, (my favorite time of the year). Since I had solar panels installed on my roof, the sun has been very accommodating with my electricity bill. Not only has it helped my pocketbook, but staying off the grid as much as possible has been a benefit to the environment in some small part. It seems even on cloudy or overcast days, the sun rays seep through and land on the panels. Now if the sun would just melt the snow cover on the fields, the birds and small creatures would be pleased. Yesterday was April Fool’s Day, but it was today that we woke up to a white April. Winter tried once again to hold its grip with a covering of snow as the blackbirds are returning en masse, red-wings, grackles and some rusties. I can fully image their confusion this morning when they awoke to a white world. Wild creatures being what they are, however, they accepted their situation and tried to make the best of it. Fortunately the bird feeders here were fully stocked and it wasn’t long before the snow was black with birds intermingled with the juncos, chickadees and jays. By noon, it had stopped snowing, the sun returned and the snow began a hesitant retreat. A few fitful starts, but spring will not be denied and the birds surely know this. I thought winter was over. February here in the Berkshires was delightful. Sparse smatterings of snow just here and there in amongst the trees. The fields were completely brown just waiting for spring to sprout new grass. We had the return of a pair of bluebirds apartment hunting. They flew from one bird house to another. The male would peek inside, sometimes go in and see how it felt. The female would sit atop the house surveying her surroundings, then she would fly to another house and the male would follow her repeating his pattern of assessing the accommodations. One day in late February, I heard the song of the red-winged blackbird; a most wonderful sound heralding warmer weather and the return of spring. Two days later, a common grackle made his presence known by visiting several of my bird feeders along with the juncos, American goldfinches, chickadees and blue jays. And then, as if withou warning, March came in blasting us with a severe Nor’easter, leaving us buried beneath 22 inches of snow. This to be followed by two more heavy snowstorms. The bluebirds have taken temporary leave of us, but the grackle hangs on with the promise of an ample supply of seed in the feeders. Daylight savings time has arrived and I live with the knowledge that spring really cannot be far behind. Last week we had a sudden rain burst and as I gazed out the window overlooking the pasture, I saw barn swallows and several rough-winged swallows “fall” out of the sky. The torrential downpour drove them down near the ground and as they sought protection from the onslaught, they struggled to reach the white pine tree beside the house. Several of the barn swallows alighted on the pasture fence. There they constantly shook their feathers trying to escape the rain. As suddenly as it started, the rain stopped and the swallows immediately took to the air, their favorite habitat.